At a whopping 70% protein content, Thor's Hammer is the perfect combination of two of the world's most powerful foods: pure chlorella and pure spirulina. Chlorella gets its name from its chlorophyll content (highest of all known plants). It is prized for its many health benefits and nutrient offerings. Spirulina is a high-energy food, valued for its detoxifying and alkalizing benefits. Chlorella and Spirulina are each considered by many in the health field as "perfect foods" - so it makes perfect sense to offer them together, in their purest form, in Thor's Hammer! This is a low-temperature, cold-pressed, truly 100% RAW, organic product. Contains NO fillers, preservatives, binders or coatings. Thor's Hammer consists of pressed tablets of pure broken-cell-wall chlorella and pure spirulina. No fillers or binders are used, so the tablets disintegrate rather quickly when consumed. Note from author of Raw Power!, Thor Bazler: "I've been taking this product (pressed tablets of a combination of pure chlorella and pure spirulina) daily for the last several years, and what I've found is that I can't believe in all my years of eating raw foods, I didn't give much attention to these amazing foods. I started out with 10-20 tablets per day, and slowly increased the amount every few days; now I'm up to about 300 per day (which is over 50 grams of protein!). Three-hundred tablets sounds like a very high amount, but it's only about 75 grams in terms of weight and actually quite easy to do once your body acclimates to it. I've heard stories of olympic athletes taking 60 grams a day, and I thought, "WOW, that would be great to be able to build up to that amount." Well, I've done it, and surpassed it. This new product has had a huge impact on my recent muscle- and strength-building, and overall health - I feel great. 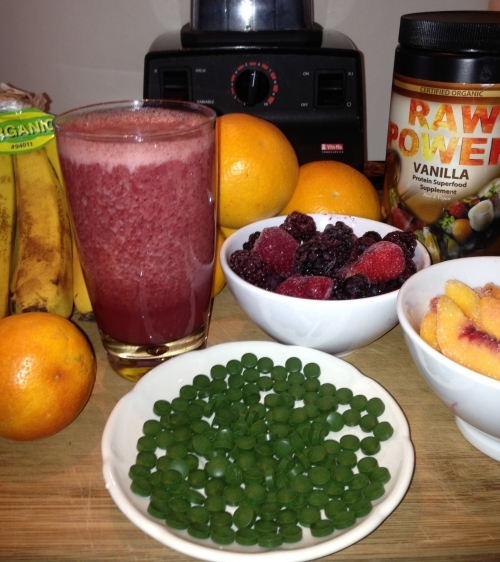 What I do is drink a Raw Power Smoothie (see picture below) or glass of organic orange juice in the morning and, with every sip, I'll take around 15 tablets. At the end of the smoothie or juice, I've taken well over a hundred tablets. That's how I start my day each morning, which I feel, for me, is the most nutritionally superior way possible. Then, throughout the day, whenever I eat anything at all, I'll take a few more small handfuls of tablets, tapering off as it gets later in the day. Then, since they are high-energy foods, I won't take any within a few hours of bedtime. I prefer tablets over powder because if I was taking powder all day, all my food would taste like chlorella/spirulina, and I enjoy a myriad of tastes, so the tablets work perfectly. If you're like me, and love to experiment and find new foods to assist with overall health and strength-building, you're going to love this stuff. Remember to start out small, your body will need time to adjust...believe me!" Each tablet is 250mg. 1000 tablets per bag = 250 grams. Take tablets with water, food, smoothies, or juices, and enjoy all the nutritional benefits Thor's Hammer (Mjöllnir!) has to offer. If the cell wall of chlorella is not broken open, the nutrients inside are not accessible, yet not all chlorella producers adequately open the cell wall. It is this outer fibrous cell wall that differentiates chlorella from any other algae. It is a unique dietary fiber found nowhere else in nature that binds with heavy metals, radiation and other synthetic toxins and effectively removes them. The producer of Raw Power chlorella uses the Pressure Release Method for opening the cell wall. They raise the pressure suddenly as the chlorella is sent through a chamber, then it is suddenly released. This is the most effective, heat-free, and organic method of breaking open the cell wall because it does not disturb the nutrients in chlorella yet allows full access to them. And nothing comes in contact with the chlorella the way other methods do. 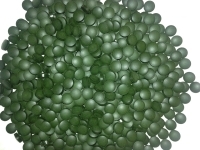 By crushing the chlorella shell, as other chlorella producers' practice, many of the nutrients are scattered and do not remain together as they should. Our process opens 99.9% of the chlorella we produce, the highest open-wall rating of any brand on the market. Our Thor's Hammer tablets are made from pure chlorella and spirulina grown organically in Taiwan, over 1300 miles from Japan (Fukushima!). Also, they are lab tested for radiation, bacteria and heavy metals twice, once before they are shipped, and again once they arrive here in the USA. - Third-party laboratory-tested. No detectable heavy metals, radiation or bacteria. - Cleanest chlorella and spirulina available anywhere. Raw Power® Brand Raw/Organic Foods and Whole-Food Supplements are regularly laboratory tested for purity, and are guaranteed to be the highest-quality, cleanest, most nutrient-dense food products available in the world marketplace today. When you see the Raw Power® label, you can rest assured that you are getting the very best. Pictured below is Thor's morning Raw Power smoothie and approx. 150 Thor's Hammer tablets. This meal is the top superfood nutrition on the planet! This page and all contents Copyright © Raw Power / Bazler Enterprises, Inc., Coeur d'Alene, ID, USA 2007-2019. Information within this site is for educational purposes only. Statements have not been evaluated by the U.S. Food & Drug Administration. These products are not intended to diagnose, treat, cure, or prevent any disease.